While chrome has a high level of shine, it is also susceptible to a condition known as pitting. When you look at older chrome pieces, you might notice small bumps and marks on the surface that give it uneven texture. The bumps are a sign of pitting, which is a type of corrosion, similar to rusting, that affects certain types of metal. 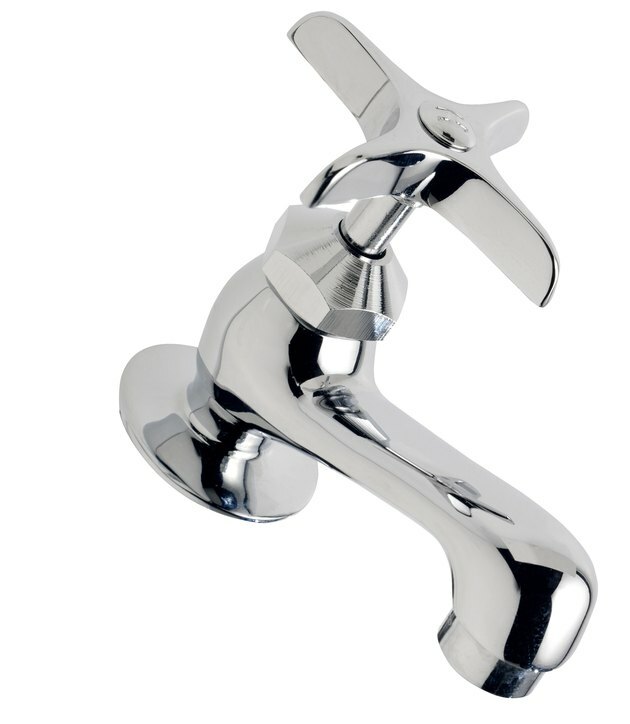 The faucets in your home are just as susceptible as car wheels, bicycle rims and other chrome surfaces. Restoring pitted chrome removes those marks and brings back the original shine of the faucet. Pitted chrome ruins the look of your bathroom. Rub dish soap on the faucet and dunk an old rag in warm water. Scrub the faucet with the damp rag, rubbing the dish soap around and removing any rust or pieces of debris from the metal. Wipe the faucet dry with a second towel. Pour distilled white vinegar on a piece of aluminum foil. Scrub the aluminum foil on the faucet with the dull side facing down. The acidity in the vinegar helps remove the pitting, while the aluminum foil shines the finish. Put on goggles and sand the faucet with fine-grit sandpaper. The goggles keep any rust or chrome from landing in your eyes. Rub the sandpaper in a circular motion, focusing on any pitted areas of the faucet. Wipe off the faucet with an old rag. Apply an even layer of chrome polish to the pitted surface. After at least an hour, gently buff off the polish with a dry cloth or rag. Rub the cloth over the faucet in the same circular motion. The polish fills in any pitted marks and restores the faucet's original shine. Examine the faucet carefully, looking for any remaining signs of pitting. Rub steel wool on the pitting marks, pushing down as you rub. Coat the areas with the chrome polish and buff again.